Saeed Ajmal is satisfied with the advancement he has made with the healing chip away at his rocking the bowling actoion activity, and has said he is focusing on the 2015 World Cup for his worldwide rebound. 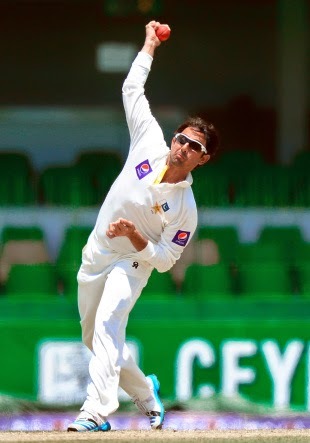 Ajmal as of late experienced informal tests on his playing activity at the ICC-authorize testing focus in Loughborough, where biomechanist Dr Mark King noted "considerable change" in his action, despite the fact that the straightening of his elbow still surpassed the allowed 15-degree mark. "I'm exceptionally satisfied with the appraisal of Dr. Ruler," Ajmal said, in a meeting with Pakpassion.net. "It was exceptionally delighting to hear what he needed to say. I was anticipating that a lessening will around 30 degrees however to see that a few conveyances are down to 20 degrees is fabulous and positive news for me. "Likewise, what is truly empowering is that the vast majority of my deliveries are presently inside the 15 degree limit. The ICC's guidelines obviously stipulate that all conveyances must be under 15 degrees and I'm extremely sure that I will attain that focus with the assistance of [former Pakistan offspinner] Saqlain Mushtaq and the various people who are helping me and managing me." Ajmal said his elbow augmentation surpassed 15 degrees just for the doosra, and that all his different conveyances were presently falling inside as far as possible. "I'm buckling down on changing the doosra to guarantee that it is likewise under 15 degrees and I'm sure that I will figure out how to do that." The ICC banned Ajmal from rocking the bowling alley in universal cricket in September. He had been accounted for after the first Test against Sri Lanka in Galle, and testing of his activity in Brisbane uncovered his normal elbow expansion to be more than double as far as possible. It was the second time Ajmal had been accounted for, however the first run through - in 2009 - he had effectively cleared tests on his activity. Ajmal said he was baffled by the absence of consistency in the test outcomes.